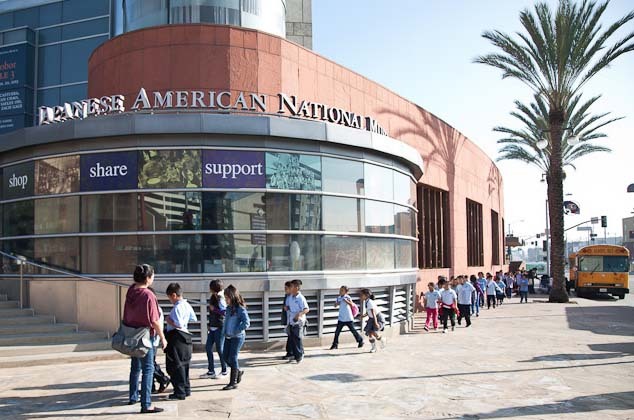 The Japanese American National Museum (JANM) is located at 100 North Central Avenue in the heart of Little Tokyo in downtown Los Angeles. School group visits are available Tuesday through Friday beginning at 10 a.m.
$5/student, $7/adult chaperone with advance reservations. See below for information about free admission grants for school groups. Please check the Visit the Museum page for a listing of our updated museum hours and admission rates. Prices subject to change. Cash, checks, and credit cards are accepted. Group payment is due upon arrival. Museum discount passes—such as 2-for-1 or Family passes—cannot be applied to groups with more than 10 people. A bus loading zone is located directly in front of the museum on First Street. Bus parking is available on Alameda Street and Central Avenue. Parking for cars is available at nearby public parking lots for a nominal fee. JANM is easily accessible by public transportation, including the Dash and Metro lines. Union Station is a 15-minute walk or a short ride on a Dash bus. Contact your local public transportation agency for bus routes, times, and fees: ladottransit.com/dash, metro.net. JANM’s Bid for Education is a fundraising initiative that helps cover admission and transportation costs for Title I schools and groups with demonstrated financial need. These grants are for groups who make advance reservations for guided and facilitated visits, are subject to strict rules, and are available on a first come, first served basis. Our Free Admission Grant is available to groups who make advance reservations and take a guided tour; self-guided groups are not eligible for this grant. Grants are for general admission only; additional program or special exhibition fees may not be covered. Due to an overwhelming demand during the 2018–2019 school year, JANM’s free transportation funds have already been allocated. Applications for free transportation for the 2019–2020 school year will be accepted beginning July 1, 2019. Free transportation grants are available on limited, first come, first served basis to school and senior groups with financial needs. If you are a Title I school or can demonstrate financial need and you are making this reservation at least three weeks prior to your visit, you may qualify for a grant for up to $350 per bus, pending availability. Bus grants are limited to two buses per school each year. Transportation Grants are made as reimbursement and not paid up-front. In order to apply for the Transportation Grant, you will need the name of the bus service you will use, total number of buses, and a cost estimate. To apply for either grant, complete the appropriate sections in the Group Visit Request Form. We will send an email to the Group Leader to confirm your reservation and notify you of the status of your grant. If you have any questions, please email us at groupvisits@janm.org. The Japanese American National Museum is fully accessible. Please notify the Education Unit of any special needs when you make your reservation. The demand for group visits is typically very high January–June and our schedule is often fully booked several months in advance. If you plan to visit during this time of year, please make your reservations early and be aware that it may be difficult to accommodate large groups on specific dates. To have your choice of visit dates, we suggest scheduling your visit between July–December. To insure that your group has a positive learning experience, adult chaperones must accompany all student groups (1st–12th grade) at all times. JANM requires one adult (21 years or older) for every 10 students. Without the appropriate number of chaperones, school groups may not be admitted to the museum. Special exhibitions/programs may require additional chaperones. When visiting the JANM Store, one adult chaperone is to accompany every five students. It is the responsibility of teachers and adult chaperones to stay with their students and monitor their behavior. Download a Letter to Chaperones (PDF) for distribution to chaperones prior to your visit. Groups who are deemed to be disruptive by Museum Security or Visitor Services may be asked to leave the museum. To book your group visit reservations you must reserve online using the online reservation form. Note: All visits must be booked at least three weeks in advance. Contact the Education Unit immediately if your group must cancel. If you cancel well in advance, your spot can be offered to another educator on our waiting list. If your group expects to be delayed, please call to inform us of your estimated arrival time. We may not be able to accommodate groups arriving more than 20 minutes late. Food, drink (including water), and gum are not allowed. Please use pencils in the galleries. Personal belongings—including backpacks and bags—are not allowed in the exhibition areas and should be left at school or on the bus. Videotaping is not allowed in exhibition areas. Visitors should not lean or sit on exhibition cases or platforms. Display cases and walls should not be used as writing surfaces. There will be other groups and visitors in the museum. Please be courteous at all times. Finally, be sure that your students and chaperones know the purpose for their visit to the Japanese American National Museum and what your expectations are while they are here. Give staff at the front desk an accurate count of students and adults in your group. Instruct bus drivers to move to appropriate bus parking on either Central Avenue or Alameda Street. Divide your students and chaperones into smaller groups as directed by the museum’s docents or staff. If you have any questions or specific concerns regarding your visit to JANM, please contact groupvisits@janm.org. The museum’s staff will be happy to help you arrange your visit logistics. Our goal is for you and your students to have a rewarding and educational visit.